“Never judge a book by its cover” goes the old saying. Yet that is exactly what I did when I spotted A Brief History of the Private Life of Elizabeth II on Amazon. With a cover picture of a carefree, laughing and relaxed Queen Elizabeth II, on the deck of Britannia and wearing a bright summery blouse, it was such a lovely picture that I immediately wanted to read the book. The main clue is in the title. With a precursor like “A Brief History”, Michael Paterson’s book was never going to be a lengthy one. Weighing in at something over 200 pages in the print version, it is by its very nature a concise history – to the point, factual (or at least presented as factual), and neatly chronological. Opening in the 1920s, it takes us right up to the present day, as the Queen was approaching her Diamond Jubilee. Yet the second clue of the title, “The Private Life”, is badly misleading. I didn’t want to read a lurid tabloid-esque account of the Queen’s life, the like that would be at home next to all those books about Diana, but I did expect it to focus on her home and family life. It doesn’t. It is, in fact, a brief history of the reign and life of Elizabeth II. It does cover her private life as much as it can, given that she is a very private person, but much of the book deals with her public life. I don’t mind at all reading an account of her life in general, but it wasn’t what the title led me to expect. What Paterson has produced however, is a very neat account of Elizabeth II’s life and reign. Chapters are generally arranged by decade, and we are taken through events in a sensible chronological structure. Paterson is largely unbiased, although this in itself leads me to believe he is a fan of the royal family. He makes some observations about decisions he believes to have been badly judged, but other than a comment about how he sees Prince Charles as the victim rather than Diana in the mess that was their marriage, he refrains from voicing his own opinion. Given the brevity of the book, this is to be desired as there is not a lot of space to waste on an author’s personal opinions when the subject of the book has had as full a life as the Queen. 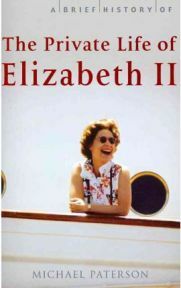 Paterson writes A Brief History of the Private Life of Elizabeth II with a generally straightforward and factual style. It is not however a dry account, as the Queen and her family do come across as real people, with their own likes and dislikes, sense of humour, and family traditions. There are some anecdotes and quotes from the royal family, some of which I recognised and some I didn’t, and some which I found slightly unbelievable. I can’t vouch for the accuracy of Paterson’s account – I imagine only the Queen could say whether it is all accurate or not – but I didn’t notice anything which was badly wrong. All the facts as I know them are correct. Although the title is misleading, the book itself really isn’t bad. For a more in depth account of Elizabeth II’s life and reign, you would need to go for a chunkier book, but for an introduction or for those who don’t want to know every little detail, A Brief History of the Private Life of Elizabeth II would be a good read. No Comments on "A Brief History of the Private Life of Elizabeth II"